Auteur : Goldberg, Harvey E.
American or Middle Eastern, Ashkenazi or Sephardi, insular or immersed in modern life—however diverse their situations or circumstances, Jews draw on common traditions and texts when they mark life's momentous events and rites of passage. The interplay of past and present, of individual practice and collective identity, emerges as a central fact of contemporary Jewish experience in Harvey E. Goldberg's multifaceted account of how Jews celebrate and observe the cycles of life. A leading anthropologist of Jewish culture, Goldberg draws on his own experience as well as classic sources and the latest research to create a nuanced portrait of Jewish rituals and customs that balances the reality of "ordinary Jews" with the authority of tradition. 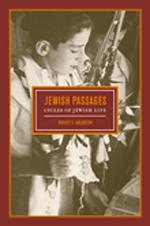 Looking at classic rites of passage such as circumcision and marriage, along with emerging life-milestone practices like pilgrimage and identity-seeking tourism, Jewish Passages aptly reflects the remarkable cultural and religious diversity within Judaism. This work offers a new view of Jewish culture and history with the individual firmly situated at their center by blending anecdote and historical vignettes with rabbinic, midrashic, and anthropological insights; by exploring Sephardi and Ashkenazi traditions as well as modern ideologies; and by bringing into sharp relief the activities of women and relations with Gentile neighbors. As such, this book provides a unique window on the particulars—and the significance—of personal and communal acts of identification among Jews past, present, and future.